The new additions are part of the Dallas Innovation Alliance's Living Lab, which is piloting smart-city solutions with help from partners like AT&T. Josh Berglund of CIVIQ Smartscapes demonstrates the West End’s new interactive kiosk, which offers visitors, maps, a selfie app, and information on local attractions and services. 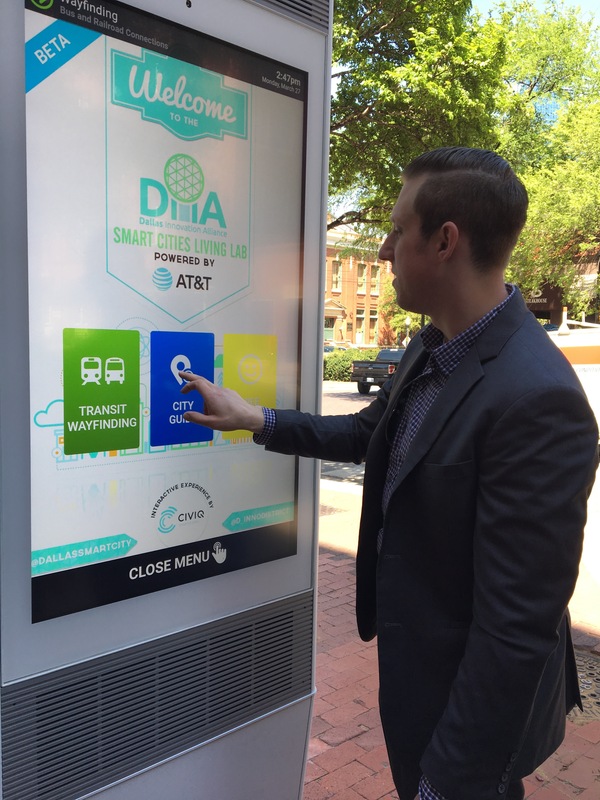 The Dallas Innovation Alliance launched the first phase of its Smart Cities Living Lab on Monday, bringing smart LED lighting, environmental sensors, and an interactive kiosk to the West End. The move marks the beginning of the alliance’s first phase of roll-outs in the West End, which is serving as a pilot area for smart-city solutions that could later expand across Dallas. The overall goal is to enhance the quality of life for local residents by improving things like safety, energy efficiency, sustainability, and infrastructure—a growing challenge in Dallas. Within the next six months, the alliance, a public-private partnership founded in 2015, plans to install public Wi-Fi and smart parking, smart water, and smart irrigation solutions. The lab is powered by AT&T and is supported by partners including Dallas Area Rapid Transit, Dallas Regional Chamber, Cisco, IBM, and Philips. Smart LED light bulbs from GE and Philips are being tested in streetlights across two blocks of the West End. The bulbs, which increase energy efficiency, can be remotely adjusted and send notifications when they burn out. The connected streetlights eventually could capture data including traffic congestion, crowd gatherings, and even gunshots—all of which would help the city proactively respond to each situation. 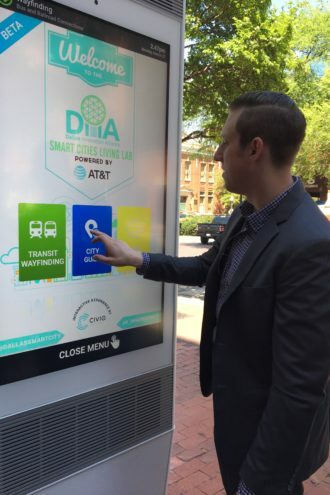 The alliance also installed a smart kiosk just outside the Dallas Entrepreneur Center. The weather-resistant kiosk includes high-speed USB outlets, a map and directions to local attractions and city services, as well as a selfie application, which allows guests to take photos and send them via email or text messaging. The kiosk, a product of Boston-based CIVIQ Smartscapes, does not store any personal information or photos, said Josh Berglund, CIVIQ’s technical services director. It also is expected to offer real-time departure and arrival information from DART, voting information, Downtown Dallas Inc. programming, and important city dates. “This is about understanding the needs of the community, and meeting them where they exist,” said Trey Bowles, CEO of the DEC and co-founder of the alliance. 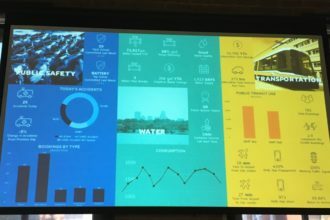 The AT&T Smart Cities Operations Center was designed to keep the mayor’s office informed about city data. A sensor installed on the roof of the DEC tracks the area’s air quality, feeding near-real-time data to a dashboard, called the AT&T Smart Cities Operations Center, designed for the mayor’s office. 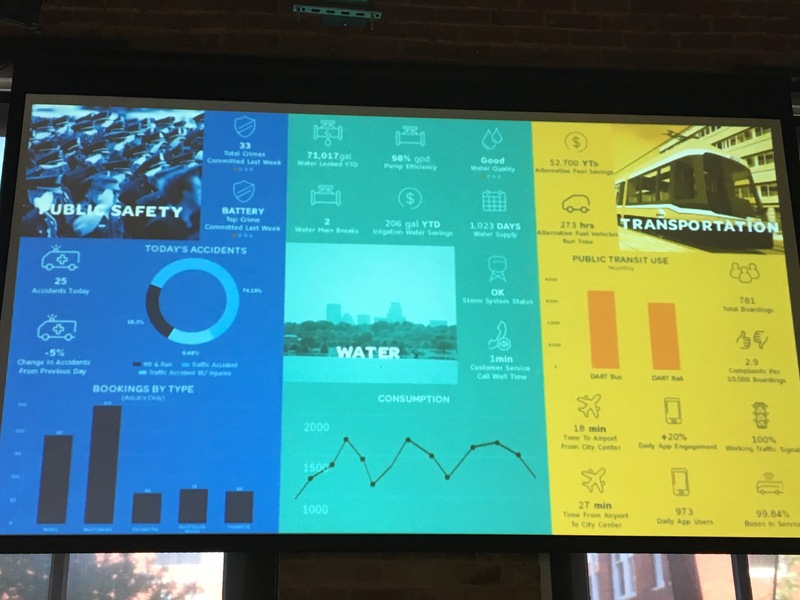 The dashboard can be customized to display all smart city items, including public safety statistics, like the number of accidents compared to the same time a day prior; water information, like main breaks and consumption; transportation, including working traffic signals and DART ridership; energy usage; and airport numbers. AT&T, one of the founding partners of the alliance, linked up with the group in 2015, when it was launching its own smart cities initiative. AT&T’s Smart Cities framework offers cities a four-pillared approach to deploy and scale their own solutions. The framework is being used in eight cities across the nation. Dallas is the first of the eight to launch a living lab using the framework. “As we start to see it scale with more solutions, this could serve as a model,” Zeto said about Dallas’ lab. For AT&T and the alliance, the living lab allows the city to test smart-city solutions without a cost to the taxpayers, as the solutions are in-kind donations from partners of the alliance. It also allows the city, and the alliance and its partners, to further community engagement to better understand how to enhance intelligent growth.